Poppy Gonzalez, a very experienced and successful teacher, was trained from the age of 5 by the renowned Childs Pianoforte School, Bourne End - also attending the Purcell School of Music, Watford (previously Harrow on the Hill) and the Royal Academy of Music, London. Having previously run an extremely successful school in Buckinghamshire and taught at the Childs school where she was trained, Poppy has relocated to Brighton in recent years and now offers one to one tuition privately, from her home in the Hanover area. Poppy specialises in teaching and inspiring children from as young as four years old, to a high standard, but in a fun and easy way to understand.Poppy's reputation as a quality teacher who is dedicated and passionate about her work, is growing rapidly in the Brighton & Hove region. Lessons include theory, aural and exams to A.B.R.S.M standards. Gill has a ARCM Pianoforte teaching diploma from the Royal College of Music, London and believes that in teaching the piano the students can take up the piano at any age. Once a child has expressed the desire to learn the piano, shows sufficient concentration to absorb ideas presented in the lesson, and understands the concept of practise, then he or she is ready. For some children this may be as young as six whilst others may not be ready until the age of nine or ten But it's never too late, either. Her oldest piano pupil didn't start until he was into his sixties. Her fees are £25 an hour for adults and £24 an hour for children. John is a successful music professional who still makes time to teach. His students range from the age of six through to the age of 55. He has a patient nature and keen enthusiastic interest in teaching. Anyone can learn to play the piano, It's not a gift born to the few ( Doctor Suzuki ). He enjoys teaching and will work hard to ensure that his students enjoy learning. He maintains a keen interest in classical piano and jazz/blues piano as well as his other musical pursuits. Playing a musical instrument such as the piano, can only enrich a persons life whether or not that person chooses employment in the field of music or not. The benefits for students of all ages are many. A quote from John is "I teach because I enjoy teaching and have lots of happy students and successful ABRSM exam passes. I also attend teaching seminars held by the Associated Board. I will never stop teaching and I will never stop learning. I am also working towards obtaining a teaching diploma with the ABRSM. I don't intend to teach in schools but would like the diploma for my own satisfaction". 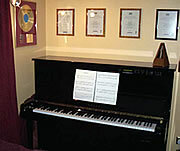 John is happy to teach in his studio where he has a good quality modern Yamaha U1 acoustic piano. A Hong Kong-born pianist who started playing the piano at the age of 3. A recipient of awards and scholarships such as a number of annual music festival competitions as well as a finalist in accompanying instrumental competitions in the UK. Jenny is currently completing her Master degree in Music Performance after receiving a Master in Music and Bachelor in Music at the Guildhall School of Music and Drama, and the Goldsmiths College, University of London under the tutelage of Caroline Palmer, Maria Krivenski and Alexander Ivashkin. Jenny is in demand as a chamber musician and collaborates with saxophonist and violinst forming a trio, Contrast, who give regular recitals in the UK, Hong Kong and Macau. She is also a professional and experienced piano teacher as well as a performer, giving one-to-one lessons to students of all ages and levels. Adrian Finnerty is a music teacher, composer, pianist, organist and examiner who lives and works just outside Glasgow. He is Principal Teacher (Learning and Teaching) of Creative Arts at Balfron High School, with responsibility for Music, Art and Design, and Drama , and has been responsible for co-ordinating and delivering a variety of staff development activities, workshops and in-service courses for teachers. He is also Organist and Director of Music at St. Andrew's Church, Bearsden, and teaches piano, theory and electronic keyboard. 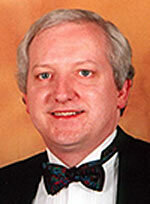 Adrian Finnerty's teaching experience has included teaching children and adults from beginners to advanced levels. Areas of work covered have included performance ( Classical and Popular styles, including Jazz improvisation, practical musicianship and accompanying), musical theory, compositional techniques, and all aspects of written coursework. Examination presentation experience has included the full range of graded practical, theory and SQA examinations, and diplomas, with many pupils gaining distinctions and a number going on to study music at college or university. He has also been responsible for co-ordinating and delivering a variety of staff development activities, workshops and in-service courses for teachers. There is some really good advice on Choosing a Piano Teacher on his website which is worth reading before choosing a teacher for yourself.